Rapper Jay-Z recently launched Roc Nation Sports, a sports management company with the goal of signing the best and the brightest futureÂ athletes. The rapper even went as far as selling off his portion of the Brooklyn Nets, as to avoid any potential conflicts with his management role. After signing New York Yankees 2nd Basemen Robinson Cano a few weeks ago, today, via LifeandTimes.com, Jay-Z welcomed the number 3rd pick in the WNBA draft, Skylar Diggins toRoc Nation. 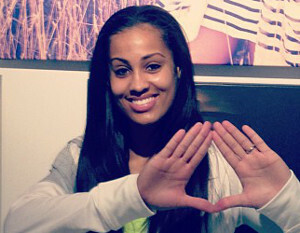 The WNBA’s Tulsa Shock player posed in a photo making the “Roc-A-Fella Diamondâ€ on the same page as the announcement. No financial details have been revealed about the signing.